High speed thrills with a unique twisting motion a modern take on a classic fairground attraction. State of the art lighting and modern sound systems make this a perfect family thrill ride, capable of taking slightly younger children for a thrilling ride. A perfect centrepiece for your event and suitable for any venue, with the benefit of being one of the fastest rides to erect and dismantle. Its easy to see where the ride acquired its name. A unique twisting motion as you circle at the end of an arm, which then circles the centre of the ride giving you a double spinning motion, thrusting you forward, before whipping you back. Not as extreme as some of the modern funfair rides, but a step up from the more sedate traditional ferris wheel or meteorite. We have added bang up to date L.E.D lighting systems, and a state of the art music system to create a modern classic perfect for any type of event. This makes a great accompaniment to almost any of our other fairground rides, and can be supplied as a package to cover all of your requirements. Like many rides, the Twist originated in the good ole USA. Eli Bridge, famous for its production of ferris wheels created the first “Grasscutter twist”, similar to the modern ride but without the flooring and constructed from scratch at each event. Edwin Hall, a renowned U.K. based manufacturer acquired the licence to produce copies of this ride and it was introduced to the domestic market around 1959. The ride carries many names in this country, usually intended to evoke the feeling of speed, such as cyclone or sizzler. At full throttle the ride is an exhilarating speed machine, but the sophisticated hydraulic control system means that it can be slowed down a little for younger clients to give a more sedate experience. 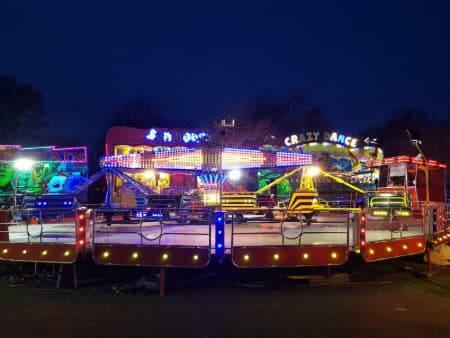 Its relatively speedy set up and derig make it suitable for events on a short timescale, where you just don’t have time to wait for a dodgem or waltzer to be erected. Check out the National Fairground Archives history of the twister. If you need more details on what attractions would best suit your event, please contact us, or check out our tips on hiring funfair attractions.